QUINCY, Mass.--(BUSINESS WIRE)--Sentient Jet, a Directional Aviation company and passionate supporter of the horse racing community, is thrilled to announce its unwavering commitment to raising awareness for Homes For Our Troops, a nonprofit organization that builds specially adapted custom homes for severely injured post-9/11 Veterans, through the extension of its partnership with Winchell Thoroughbreds LLC and sponsorship of contender Tenfold at the 2018 Belmont Stakes on Saturday, June 9th. 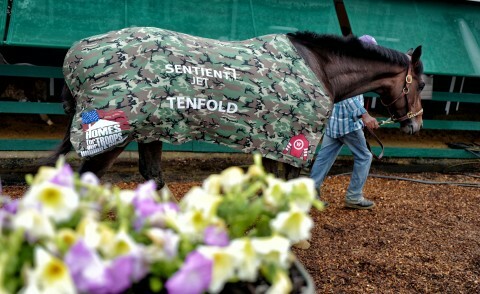 The announcement builds upon Sentient Jet’s larger awareness campaign in support of the organization, which began with the company’s sponsorship of Combatant at the Kentucky Derby followed by Tenfold at the Preakness Stakes. The campaign has already garnered significant local and national media attention across both the horse racing and larger consumer landscape, with coverage in The Los Angeles Times, Thoroughbred Daily News, and ESPN Louisville, among others. The campaign has already generated $40,000 in direct donations and also captured the attention of private aviation guru and Forbes contributor Doug Gollan, founder of Private Jet Card Comparisons, who has pledged a donation from every subscription purchased through June 19, 2018 directly to Homes For Our Troops. Considered a furious contender to challenge Justify’s bid for the Triple Crown, next Saturday’s historic 2018 Belmont Stakes will provide an even more visible platform for Tenfold to raise awareness for this important cause. “No matter how Tenfold places on June 9th, he will be winning for Veterans everywhere through the awareness and funds he is raising for this noble cause. We are proud to do our part to honor the achievements of both the organization at large and the heroic men and women that it serves,” said Andrew Collins, President and CEO of Sentient Jet. As part of the partnership, Sentient Jet will once again host US Veterans for an exceptional day at the races, offering them a personal introduction to the Belmont field and seating in the luxurious G.H. Mumm Champagne Room. Among the list attending will be Veteran Marine Staff Sergeant Charlie Linville. An inspiring and avid mountain climber, Staff Sergeant Linville is the first amputee Veteran to reach the top of Mount Everest. Homes For Our Troops builds and donates specially adapted custom homes nationwide for severely injured post – 9/11 Veterans. Most of these Veterans have sustained life-altering injuries, and these homes enable them to focus on their family, recovery, and rebuilding their lives. Since its inception in 2004, nearly 90 cents of every dollar have gone directly to program services for Veterans. Homes For Our Troops builds homes where a Veteran chooses to live and continues its relationship with the individual after home delivery. Empowered by the freedom that a donated, specially adapted custom home brings, Veterans can focus on their recovery and returning to their life’s work of serving others. Handled by Steve Asmussen and owned by Winchell Thoroughbreds LLC, the co-owners of 2017 Horse of the year Gun Runner and two-time winner of the Kentucky Oaks with Summerly and Untapable, Tenfold is a three-year old Thoroughbred who has placed first in two of four races run in the 2018 season. Most recently, Tenfold placed third at the 2018 Preakness Stakes in Baltimore, Maryland, solidifying his position as one of the most promising horses in today’s racing landscape and a strong contender for the 2018 Belmont Stakes. Founded in 1999 and now an integral part of Directional Aviation, Sentient Jet is one of the leading private aviation companies in the country. The Sentient Jet Card Program offers clients the flexibility and convenience of flying private for their personal and business air travel needs with industry-leading value. Sentient Jet is known for outstanding service and a commitment to safety programs, including the industry’s first and only Independent Safety Advisory Board. Sentient Jet’s extensive network of certified operators ensures that clients will always have access to executive aircraft that meet their rigorous standards for safety and quality. Boasting a robust digital heritage, Sentient launched a mobile app in 2016, allowing Cardholders to book private jet travel on-demand, as well as receive flight details, immediate assistance through a 24/7 live chat feature, and localized recommendations for exclusive benefits. Visit sentient.com for more information. You can also follow Sentient Jet on social media platforms, including Twitter, Facebook and Instagram. Homes For Our Troops (HFOT) is a privately funded 501(c) (3) nonprofit organization that builds and donates specially adapted custom homes nationwide for severely injured post – 9/11 Veterans, to enable them to rebuild their lives. Most of these Veterans have sustained life-altering injuries including multiple limb amputations, partial or full paralysis, and/or severe traumatic brain injury (TBI). These homes restore some of the freedom and independence our Veterans sacrificed while defending our country, and enable them to focus on their family, recovery, and rebuilding their lives. Since its inception in 2004, nearly 90 cents of every dollar has gone directly to our program services for Veterans. HFOT builds these homes where the Veteran chooses to live, and continues its relationship with the Veterans after home delivery to assist them with rebuilding their lives. Visit https://www.hfotusa.org/ to learn more.